Mubychem Group, established in 1976, is the pioneer manufacturer of Sodium Phosphate Monobasic, Pharmaceutical, Fragrance & Flavor chemicals in India. Mubychem Group has several manufacturing facilities spread across Gujarat and Mumbai India and world wide contacts and toll manufacturers. We are exporting globally to countries like USA, Europe, UAE, South Africa, Tanzania, Kenya, Egypt, Nigeria, Uganda, Turkey, Mexico, Brazil, Chile, Argentina, Dubai, Indonesia etc. Mono Sodium Phosphate or Monosodium Phosphate (NaH2PO4, MSP), also known as anhydrous monobasic sodium phosphate or monosodium phosphate or sodium phosphate monobasic, is used as a laxative and, in combination with other sod. phos., as a pH buffer. The pKa is 7.20. The sodium chloride equivalent value, or E-Value, is 0.49. It is soluble in 4.5 parts water. 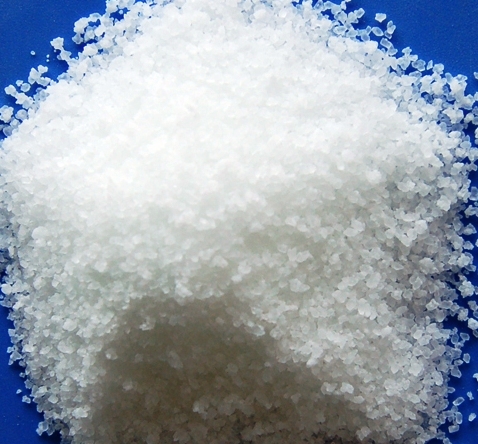 Monosodium phosphate is most commonly available as colorless crystals or a white powder. Sodium phosphate monobasic is insoluble in alcohol. Sodium Dihydrogen Phosphate Monohydrate contains not less than 98.0% and not more than 100.5% of NaH2PO4, calculated with reference to the dried substance. Colourless crystals or a white powder. Very soluble in water; very slightly soluble in ethanol (96%). Dissolve 10.0 g in sufficient carbon dioxide-free water prepared from distilled water to produce 100 ml (solution S). A. Solution S is faintly acid. B. Solution S yields the reactions characteristic of phosphates. C. Solution S neutralized with a 10% w/v solution of potassium hydroxide yields reaction A characteristic of sodium salts. D. Complies with the test for Loss on drying. pH of a mixture of 5 ml of solution S and 5 ml of carbon dioxide-free water , 4.2 to 4.5. 0.5 g complies with the limit test for arsenic - 2 ppm. 12 ml of solution S complies with limit test A for heavy metals. Use lead standard solution (1 ppm Pb) to prepare the standard (10 ppm). 10 ml of solution S complies with the limit test for - iron 10 ppm. Dilute 2.5 ml of solution S to 15 ml with water. The resulting solution complies with the limit test for chlorides - 200 ppm. To 5 ml of solution S add 0.5 ml of hydrochloric acid and dilute to 15 ml with distilled water. The resulting solution complies with the limit test for sulphate - 300 ppm. To 5 ml of solution S add 0.25 ml of 0.02M potassium permanganate and 5 ml of 1M sulphuric acid and heat in a water bath for 5 minutes. The solution retains a slight red colour. When dried to constant weight at 130°, loses 11.5 to 14.5% of its weight. Use 0.5 g.
Phosphoric acid, monosodium salt, monohydrate. Monobasic Sodium Phosphate contains one or two molecules of water of hydration, or is anhydrous. It contains not less than 98.0 percent and not more than 103.0 percent of NaH2PO4, calculated on the anhydrous basis. Identification— A solution (1 in 20) responds to the tests for Sodium 191 and for Phosphate. pH: between 4.1 and 4.5, in a solution containing the equivalent of 1.0 g of NaH2PO4·H2O in 20 mL of water. Water: less than 2.0% (anhydrous form); between 10.0% and 15.0% (monohydrate); between 18.0% and 26.5% (dihydrate). Insoluble substances— Dissolve a portion equivalent to 10.0 g of NaH2PO4·H2O in 100 mL of hot water, filter through a tarred filtering crucible, wash the insoluble residue with hot water, and dry at 105 for 2 hours: the weight of the residue so obtained does not exceed 20 mg (0.2%). Chloride— A portion equivalent to 1.0 g of NaH2PO4·H2O shows no more chloride than corresponds to 0.20 mL of 0.020 N hydrochloric acid (0.014%). Sulfate— A portion equivalent to 0.20 g of NaH2PO4·H2O shows no more sulfate than corresponds to 0.30 mL of 0.020 N sulfuric acid (0.15%). Aluminum, calcium, and related elements— A solution containing the equivalent of 1.0 g of NaH2PO4·H2O in 10 mL of water does not become turbid when rendered slightly alkaline to litmus paper with 6 N ammonium hydroxide. Arsenic—the limit is 8 ppm. Heavy metals—the limit is 0.002%. Sodium Phosphate, Monobasic, is anhydrous or contains one or two molecules of water of hydration and is slightly hygroscopic. The anhydrous form occurs as a white, crystalline powder or granules. The hydrated forms occur as white or transparent crystals or granules. All forms are freely soluble in water, but are insoluble in alcohol. The pH of a 1:100 solution is between 4.1 and 4.7. Identification: A 1:20 aqueous solution gives positive tests for Phosphate and for Sodium. Assay: Not less than 98.0% and not more than 103.0% of NaH2:PO4 after drying. Fluoride: Not more than 0.005%. Insoluble Substances: Not more than 0.2%. Loss on Drying Anhydrous: Not more than 2.0%; Monohydrate: Between 10.0% and 15.0%; Dihydrate: Between 20.0% and 25.0%.